When making gold with herbalism, one should choose a herb that has limited availability, so there's more gold to be made when selling it. Sure, common herbs sell a lot faster, but overall there's more gold to be made if you focus on multiple herbs and not only Cataclysm herbs! TBC herbs are excellent examples. This instance is a Gold Mine! gather all Ancient Lichen you run into. The other loot you're getting is worth more than the Ancient Lichs, especially if you know how to disenchant the greenies and have a tailor who puts the Netherweave cloth into good use, such as bags. Ancient Lichen can be found inside instances and gathered from plant creatures with herbalism, such as bog giants around Zangarmarsh or trees in Skettis. How to make a lot of gold! There's a few choices on where to farm Ancient Lichen. 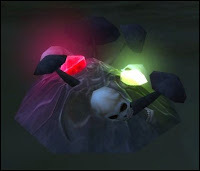 The best of all in my opinion is Underbog, because you can combine it with a killer gold making method that focuses on the Sanguine Hibiscus you're getting from the instance. Nevertheless, all of the instances are profitable to farm (on heroic mode mainly) if you clear them fully, so choose whichever suits you the best! With so many sellers there's lots of undercutting! Mainly because there's often no one selling any! If you do not know where an instance is located, post a comment below, or wait for a Loot Hunters' Instance Farming post about it.